An earlier article discussed extending your existing app’s functionality through the use of Today Extensions. 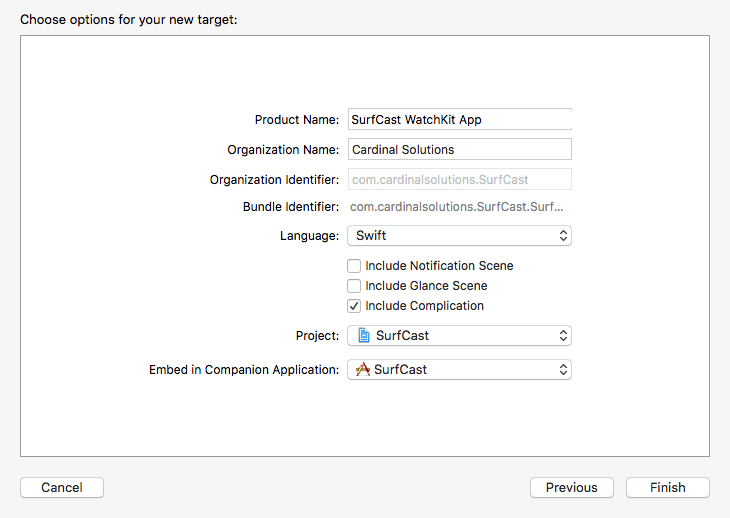 With the release of the Apple Watch and watchOS 2 came yet another avenue for extending the presence of your existing iOS app: complications. Complications fall into one of five “families”: Modular Small, Modular Large, Utilitarian Small, Utilitarian Large and Circular Small. 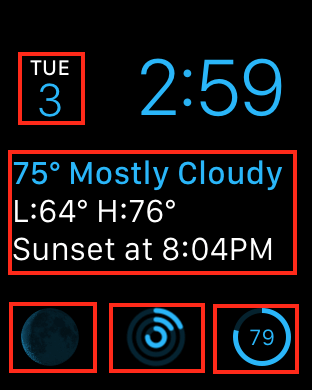 This article describes building a Modular Large complication that also supports Time Travel to display time-based information for your app. 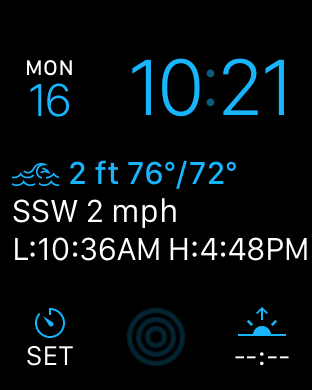 In the above image, the large rectangle in the middle of the screen is a Modular Large complication from the Dark Sky app. In this image, you’ll see we’re displaying the current wave condition via an image on the left side of the first row. represents choppy conditions, represents fair conditions, and represents clean conditions. 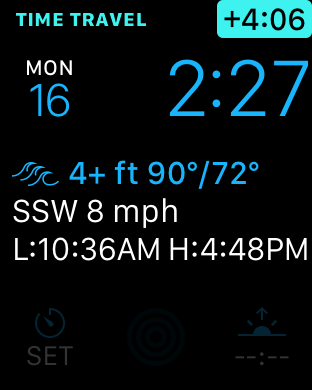 Next to the image comes the wave height, air temperature and water temperature. 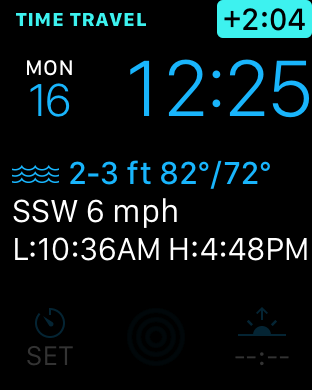 Line two represents wind direction and speed, while line three lists low- and high-tide time values for that day. For our sample, select only Include Complication. 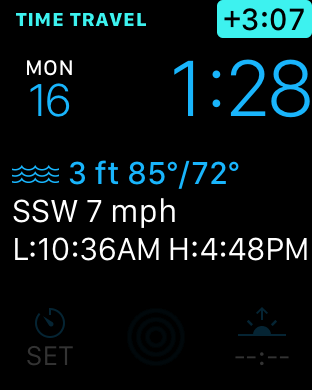 The other WatchKit options (Notification Scene and Glance Scene) won’t be discussed in this article. 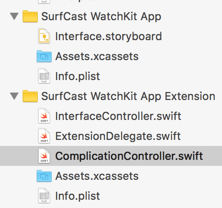 The controller ComplicationController.swift is where we’ll add all of our code. Upon opening this controller, the first thing you might notice is that it implements the CLKComplicationDataSource protocol. For this sample app, we’ll look at the important protocol methods based on the following logical groupings: Timeline Configuration, Timeline Population and Update Scheduling. 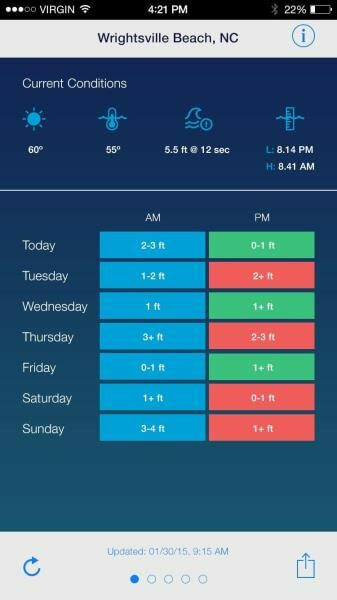 Now that we’ve indicated the date ranges and lock screen behavior, we need to implement three methods that provide past, current and future data for the complication. Past and future data are needed for supporting Time Travel, a feature that allows you to display date-based information for past and future events in your complication. The CLKComplicationTimelineEntry object needs an NSDate and a subclass of CLKComplicationTemplate — in our case, a CLKComplicationTemplateModularLargeStandardBody. The rest of the code simply populates the template with values from the HourForecast instance. The first timeline population methods we need to implement is getCurrentTimelineEntryForComplication:withHandler. 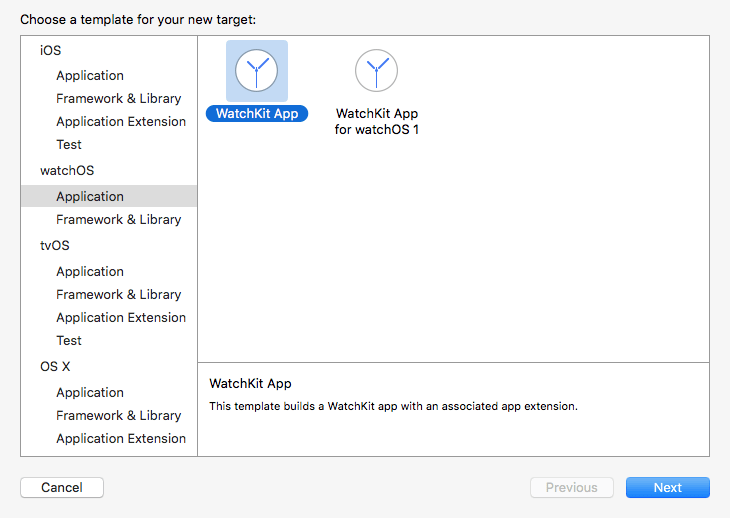 Now, we have to provide watchOS with CLKComplicationTimelineEntry objects for past and future dates by implementing the methods getTimelineEntriesForComplication:beforeDate:limit:withHandler and getTimelineEntriesForComplication:afterDate:limit:withHandler. Our final group of methods center around scheduling updates for timeline entries. The first, getNextRequestedUpdateDateWithHandler, returns an NSDate object that indicates when the next update should be take place. Our next scheduled update should be in about two hours. Here, we instruct the complication server to reload the timeline. Once the Apple Watch emulator launches, you’ll need to customize the watch face to include the new complication. To send a force touch to the emulator, you’ll need to change the Force Touch pressure to Deep Press using the key combination - -2. - -1 will return Force Touch pressure to Shallow Press. 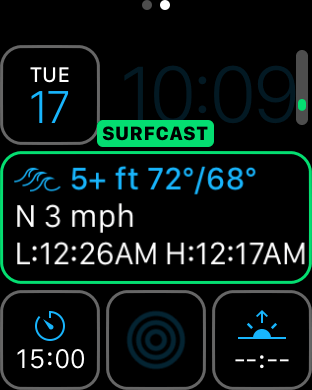 Again, we were able to quickly and easily enhance our existing app by extending it to the Apple Watch by simply reusing the services from our existing app and adding a few classes. This article originally appeared on June 7, 2016. What are Insight’s terms and conditions?